A Story Untold: SHIFT Blog Tour! READING: Shift by Jeri Smith-Ready + GIVEAWAY!!! SHIFT Blog Tour! 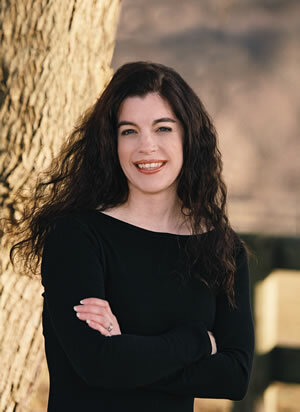 READING: Shift by Jeri Smith-Ready + GIVEAWAY!!! I have to admit, I've put myself in a very difficult postion: not only did I finish Shift in a day and then I didn't have Shine to read immediately afterwards, not only Karen had offered me to participate in the Shift blog tour she would be the host of, now I have to write a review and find a way to even remotely express the emotions that Shift stirred up in me. Brilliant, incredible, awesome, amazing, beautiful, breathtaking. Shift was all that and more. Honestly, I don't think there is a reason to dwell on Jeri's writing. From the first couple of pages in Shade I knew she is a criminally-talented person, with an insane taste in music and I totally envy her for that! So me praising Jeri's writing skills is kinda redundant because it's already been established, it's an undeniable fact. Now, to the story. Everyone who knows me knows I am Team Logan all the way (and here I promised myself not to use the word "team" in this review,ugh!). Especially after the first scene, which admittedly is one of the best things I have ever read, I thought I couldn't possible love him more. But something happened in Shift and I found that Zack began to grow on me by the end of the book. Don't get me wrong, I am not about to start having second thoughts about Logan and suddenly become this huge Zach fan, but now I kinda get why Aura wants him in her life, he's a cool and interesting guy. And that prom-scene…whew!Hot Hot Hot! So, I had no problem with any of the guys in Shift. The only problem I had was with THE girl, Aura. Well, not a problem per se, but let's just say a slight disagreement. Like how I seriously cringed when Aura acted a certain way with a certain someone. I know I am a huge tease telling you about this scene and that scene, but since I don't want to spoil the book for those of you who haven't read it yet, I have to and want to comment on some parts of it that drew my attention. Otherwise, my review would be nothing but "Awesome. I loved it. Team Logan FTW". Ah, I wish it was that simple! But I digress. Back to Aura. I'm still not sure what to think of Aura's actions, to be honest. No idea why she did what she did. Not that it is such a big deal which she can never come back from,no. But it still seems pretty off to me. I am certain that there is a reason behind this sudden change of character, because I believe Shade's Aura would never have done what Shift's Aura did. Maybe she is still confused and an emotional mess after what happened to Logan and she's still trying to figure out her feelings towards Zack, although they're pretty clear to me. Those of you who've read Shift and know what I'm talking about, I'm looking forward to your input in this. Also I didn't like her being relieved when she didn't see Logan whenever she was about to meet Zack. He was the love of your life, girl! Relief is not a feeling you should have. But again, this is totally subjective since I'm Logan's girl and felt a little sad that he didn't appear a lot in this book. Long story short, I LOVED SHIFT WITH ALL MY HEART!! !I'm in love with Jeri's writing and her world building and please please can I have Shine now? ?Because trust me! After finishing Shift you're gonna want to read it right away! Jeri Smith-Ready’s latest release is SHIFT (May 3), the second in the YA ghost trilogy that began last year with SHADE (now available in paperback). She loves to hear from readers, so please visit her at www.jerismithready.com, or better yet, on Facebook (www.facebook.com/jerismithready) or Twitter (@jsmithready), where she spends far too much time. 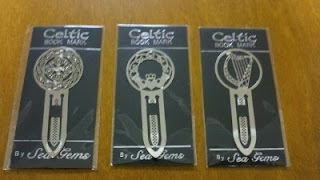 Prizes: Winner # 1 gets a signed copy of SHIFT, plus a shiny "Celtic bookmark," courtesy of Jeri. Winner #2 gets an unsigned copy of SHIFT, courtesy of Jeri’s publisher. Just leave a comment below with your email address in order to enter. This giveaway is open to everyone for the next 24 hours, when a winner will be announced at this blog. Additionally all commenters will be entered into a draw to win the Grand Prize - annotated copies of SHADE and SHIFT, an early copy of SHINE (book three of the series, of which there will be no other ARCS) and an iPod Shuffle! Ohhh, awesome review, G! I've read Shade (and have the ARC stashed somewhere in my bookshelf) and I absolutely love it! So it's not weird that I'd probably give a piece of me just to get an ARC of Shift. 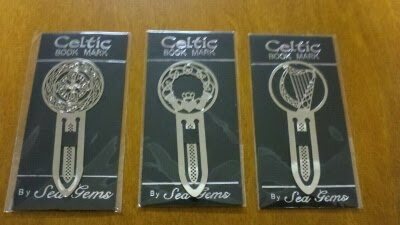 And that gorgeous bookmark! Thanks for making the giveaway International! EPIC international giveaway! (You've totally gained your blog a lifelong follower for this!) Excitement! Shift was an emotional read for me, too. I loved every second of it!!! I'm so looking forward to reading Shift! Can't wait to get my hands on a copy!! I ordered my copy of shift two days ago and i can't wait to read it!! awesome giveaway. I would love to win. I can't wait to read this!!! Thank you so much! Thanks for the awesome review, this sounds so good!! What a great blog/review! Everyone says this book is amazing. I would love to read it. Thanks! I finally broke down and got Shade when it came out in paperback. I'd love to win a copy of Shift to go with it. It sounds like Shift is even better than Shade! Shiny things, lol I'd love to win, thanks for the chance. 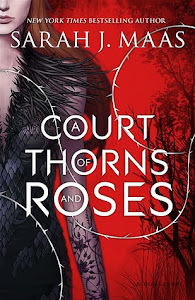 I haven't read this series but your review makes me want to give it a go. Book marks are great and books even more add the signed part and it's a contest I just have to enter. I kind of got, Aura and how she felt and what she did. Such an awesome book, wasn't it? Glad you loved it too and thanks to all for another contest. I have to say that I got what Aura was going through. Aura did act differently in Shift because she isn't the same girl that she was in Shade and because she's still grieving for Logan (even though she can technically still see him). And grief can make you do some strange things. She's growing up and realizing that while Gina's methods may be wrong, her belief is right. Logan can't stay a ghost forever. Not can't, Shouldn't. Shift was a really emotional book. I finished it in one day too so we're in the same boat, waiting forever for Shine! Great review by the way and I can't wait to read Shift and most likely Shine too! Thank you for opening the giveaway to international readers! I'm still not sure what side I'm on but hopefully I will be able to decide after Shine is published in 2012. Such a crazy long wait though after finishing Shift, which was sooo amazing! I also read it through Galley Grab but ordered my own copy right away. Great review - it really is a great book, although I agree with what you said about Aura. But it all ties in with her personality in the first book and I think she comes out of it all pretty well and more sorted. Sort of! Great review even though I am team Zach. I'm dying to read Shine when Jeri finishes it!! A whole year is pure torture. Thanks for the giveaway. The book sounds good! Great review Giota! I haven't even read Shade and you've managed to make me want to read it so, so much! I think it's going to be one of the books I order next! at first i was like "AURA WTF?!" but i think she was just looking for someone to fill a void & kinda distract her. SHIFT was completely amaze, it blew me away! I am still trying to process all the stuff that happened!! Thank you for the in-depth review and for the wonderful giveaway!! You've made me all the more excited to read this, I can't wait to get my hands on a copy! Wonderful review! So glad to have you on the tour!!! It is hard to do a review without any spoilers, huh? I loved this book even though i missed Logan a lot. I also believe the same thing that you didn't approve Aura did, was my favorite part of the whole book. (the D thing? )I actually thought about it since the first book, so i was a little surprised but totally happy it did happen. I read the first book, and I'm looking forward to the next one! Thanks for the giveaway. Fantastic giveaway! Loved the interview! Thanks for the giveaway! Can't wait to read Shift. Thanks for the awesome giveaway!! I can't wait to read this book. Thanks for sharing!! Cant wait to get to read it. Thanks for the awesome giveaway! Awesome review! 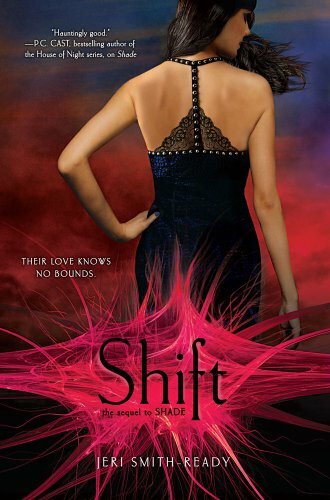 I can't wait to read Shift! Great review and thanks for the giveaway! I'd so want to read this! I've been on the lookout for this series for a while now and after reading your 5 stars review I'm even more eager to read it. Jeri Ready-Smith is an amazing writer! Thank you for the opportunity! Great giveaway. I'm lookingfoward to reading Shift. Winner will be announced shortly on this blog.